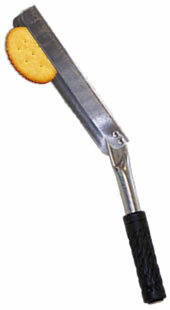 Crazie Cracker Cracker Thrower - Throws Ritz or Any Other Flat Object! Crazie Cracker is a Ritz Cracker Thrower designed to throw Ritz Crackers (or any other flat object) to challenge every level of shotgun shooter. It can also be used to feed seagulls and see how much fun it is to watch their acrobatic ability and speed when they go after them. This is the ultimate toy for the sporting enthusiast that has everything. Similar models have been seen on TV and sold in large mail order catalogs such as Orvis. Only $24.95! Buy one today! Dealer inquires are always welcome. Copyright © 2006, Retriever Sporting Clays, Inc.